In Part 1 of this series, I looked at use of composite repos to provide a way of combining update sites into a single URL for ease of use and a single point of entry from which to do updates. Now, I'd like to talk about how to escape the proliferation of zips needed to establish a target platform. For those unfamiliar with the term "target platform", it's either the installed base against which you're compiling your code, or it's the collection of things you have to install first before you can install something on top of that. However, to do a reproduceable PDE-based build, you still need to create this base install. 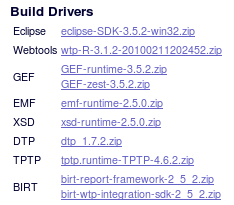 Traditionally, PDE's approach was to download and unpack these zips into the root of the Eclipse install running the build. Athena attempted to improve on this situation by allowing you to define a list of update sites and IUs (features and/or plugins) which were needed to define the platform. But it was far from portable, and hardly reusable. Buckminster (later b3) also approached this problem by creating its own markup for defining what sites and what IUs to install, backed by an EMF model. But rather than dealing with a UI to create the model and populate it, I found it more useful to simply generate an instance of the aggregator model and then use the aggregator to fetch & install IUs. But as the aggregator is simply a wrapper for the underlying p2.mirror and p2.director tasks, you can use those directly too. But as they say... "Don't bore us, get to the chorus!" So, here's some sample code for the various solutions for build-time provisioning. Using the b3 aggregator (properties file) - stopped worked consistently due to network timeouts resolving deps & fetching IUs. So, with these tools, you could create a p2 repo from other repos - mirroring and installing IUs as needed - and even script an installation. But was there a better way? Enter the target platform definition file (.target). This file contains a list of IUs and the p2 repos from which to provision them. So, it's like a b3 aggregator model, or an Athena build.properties file, but abstracted away from the concept of a build, because it can be used for building but ALSO for provisioning a user's installed Eclipse base. Unfortunately, the Target Platform Definition File editor in Eclipse 3.6 is less than optimal for large targets, or when your internet connection is suboptimal. So, after fighting with it for a while, filing bugs, and ultimately giving up, I went back to my handy-dandy XML editor (often just vim) to maintain it more simply. So rather than having Eclipse automatically install things based on a .target file, I revert to a workflow that actually works: installing by hand from an update site. While Buckminster does support .target files (or so I've read), I didn't want to be dependent on it any more, preferring a more "pure" solution. So, based on code from Peter Nehrer (@pnehrer), I then wrote an XSL transform to create a p2.mirror script from a .target file, wrapped with another Ant script (and optionally, a Maven pom.xml script). And yes, much (or all) of the above can be done w/ Buckminster and/or b3, if you like that approach. But I prefer to create the .target as input to a build process, rather than being explicitly tied to one. So, as I noted above, if you have a .target file, you can easily generate a p2 repo, and use that repo to run downstream builds. Now, instead of having a half-dozen zips to download and unpack with every build (using the deprecated and unsupported "dropins" method) you can use a fully-p2-friendly repo site which contains everything you need to do your builds - whether you're a Hudson server or a developer working at home or offline. Unlike "a collection of zips" this single-source-site can be versioned with each release. It only contains WHAT YOU ACTUALLY NEED rather than extraneous sources and doc and tangential plugins/features you don't. It's a bit like making muffins by first grinding your own flour, but at least you know there's nothing evil in that muffin mix, and you will be able to consistently reproduce the recipe every time, regardless of where you might be on teh interwebz. f you're a keener / beta tester who likes to build against the latest milestone (or even a weekly integration build) of Eclipse 3.next or 4.future, you can use the script above to self-update. So, while the TP itself is a contained snapshot listing the explicit versions of feature groups needed, it can also be run in "get the latest available" mode in order to keep your TP current against some HEAD or trunk development / releases. By splitting the TP out of the build, you can build it upstream. So, where in the past we had one "uberbuild" and an implied TP therein, now we have a TP build job, and it is then shared by the 34 downstream jobs which depend on it for their dependencies. The rest of the code is here. In part 3, I'll look back at the success we've had using associate sites instead of asking people to manually add 3rd party URLs when installing JBoss Tools. SPOILER ALERT: one URL is easier for people to use than 6. In part 4, I'll talk a little about how to prevent your product build from getting updates from unofficial sources, and preload your product with the official sites from which to get updates. Because it's important to balance ease of use with prevention of unsupported features. SPOILER ALERT: may contain p2.inf instructions.